The Corbeau Sportline RRB combines the brilliance that is the new Sportline series of seats with the lateral support of a Corbeau race seat. If you look at the way the thigh bolsters come into contact with the back of the seat, you will notice how it still gives that “bucket” look and feel that you see in a fixed back seat, while not eliminating the convenience of a reclining seat. The Sportline series from Corbeau factors in feedback from customers all over the world to come up with a look and feel that is second to none. Unbelievable comfort, style, and support are put into every inch of this seat. It features top of the line injection molded foam, strategically placed bolsters to support you in just the right places, and harness belt capability. The Sportline RRB seat is available in our black Jacquard Cloth with a black Carbon Fiber Vinyl contrast. Jacquard Cloth is known in the aftermarket seating industry as being among the most durable of any cloth seating material. The RRB has a seat base height of only 2.5 inches. That means is if you sit the seat on the floor the distance between the floor and where you would sit is 2.5 inches. Comparatively speaking this is a thin seat base, which is ideal for minimal headroom applications or for drivers wearing helmets. As a rule of thumb, the Sportline RRB will fit up to a 38" waist. Vorshlag keeps a sample seat in our lobby for "test sitting" - stop by and take a test drive of this reclining, track-worthy seat! Harness slots for 4- and 5-point racing harness capability. A submarine slot in lower cushion. Also works with OEM 3-point belts. NOTE: Due to the oversized dimensions of this product, shipping is a bit pricey. We understand that and ship them as economically as we can. 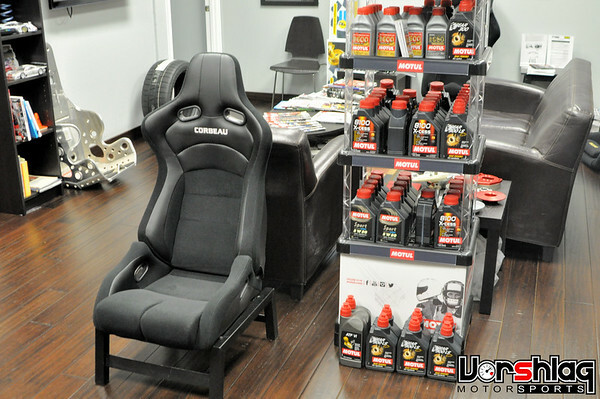 We can often ship these seats more cost effectively than the online ordering system allows - please call Vorshlag directly to place your order.